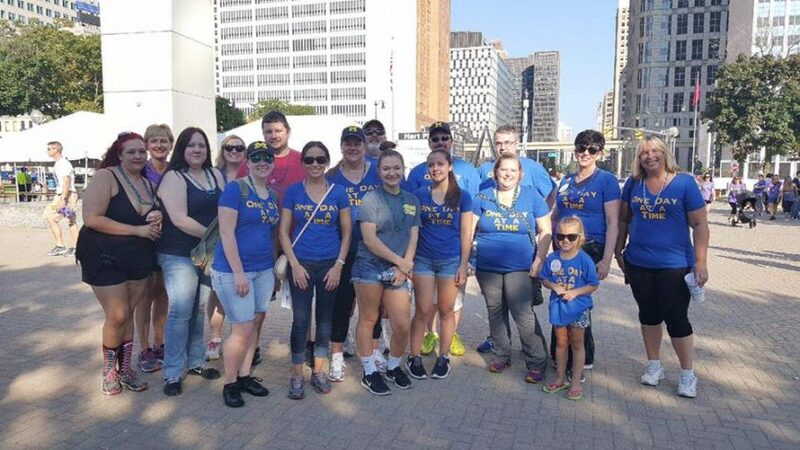 September 23, 2017 the Department of Pharmacy Services joined 2000 walkers in Hart Plaza for the Out of the Darkness Metro Detroit Walk sponsored by The American Foundation for Suicide Prevention. So far our team, One Day at a Time has raised $4115.00 and donations are still coming in! We want to thank everyone who has donated and those who participated in the walk. Our department got involved with this group in 2014.The daughter of one of our employees was attending the Boston Marathon during the terrorist attack. If that was not enough emotional trauma, she lived in Watertown, right across the street from where one of the terrorist, Dzhokhar Tsarnaev was hiding in the boat. As a result she has PTSD and suicidal ideation . If it were not for a friend recognizing her deep depression she would not be here today. This organization has helped turned her life around and she is now an advocate for the AFSP. To this day she still suffers from depression and PTSD, but now has the tools to help her cope. Bringing her story to our staff opened the conversation and helped our staff share their stories of loss. Talking about depression and suicide does save lives. Did you know a life is lost to suicide every 12.8 minutes in the United States? Suicide is the third leading cause of death among fifteen to twenty-four year olds and the second leading cause of death among college students. However, most Americans remain unaware that suicide is a national health problem. The impact suicide has on the lives of family members, friends, co-workers and the community is devastating.